Has anyone received their Smash orders? Curious if they are US or Latin American like the Grey Switch I recieved. I have US Mario Kart and wondering if this would make any difference. Would I need multiple accounts? Got it yesterday. It has the ESRB rating (does Latin America even have its own rating system?) and all the text on the back of the box is in English and Spanish with the English text either being bigger than or at least on top of the Spanish text. Nothing inside the box except the cartridge. Smash is USA. Confirmed by some people on SD and Reddit whose orders shipped on the 5th and got it yesterday and Friday. My switch got delivered today. There’s FCC compliance info on the back, so it’s probably a US unit? To think I had no plans to buy a Switch until the release of Pokemon 2019 and now I have a Switch, a Pro Controller, and Smash thanks to Facebook lol. Btw, all the new Smash owners here need to remember to register their game with their Nintendo Account (you do this on the Switch home screen) so you can get Piranha Plant for free. They will email you a code at some point. Being a new Switch owner, I had to look up how to register physical games. So if I'm understanding this correctly...people who got a XAW are NA switches even though they might have a LA warranty slip in their box? And I need to contact Nintendo to fix the activate the warranty or something? My first copy of Smash was scheduled to be delivered today, right up untl about 3 hours ago, then it changed to tomorrow...now it's arriving with my other copy and the 8bitdo tomorrow. It's only a day, so nbd. Edit: Also, where is the FCC compliance people are talking of? On the actual tablet or the box? Edit 2: My first copy of Smash ended up coming in today anyway. All of NA/SA use ESRB. They also should end up with the same region code. I still haven't had any updates since ordering (not even a pre-shipping thing) and no responses from email and Facebook message I sent on Friday. Is anyone else having these issues? Woops kinda mixed up what the post meant, I'll quote it here and you can check the link out for other info. Activating the warranty makes no sense, when an item with a serial number is scanned and sold, it immediately dings for inventory/tracking purposes, so Nintendo knows it's been sold. Once an item is sold, warranty is activated from that day to 365 days out. I have since sold the Switch, I personally didn't try it. Like I mentioned maybe my wording/understanding was wrong and it was more so ownership change rather than warranty activation. My copy of Smash arrived today and it's definitely a LatAm version. I popped this cartridge into my Switch, which already had a USA save file, and it loaded the save just fine. 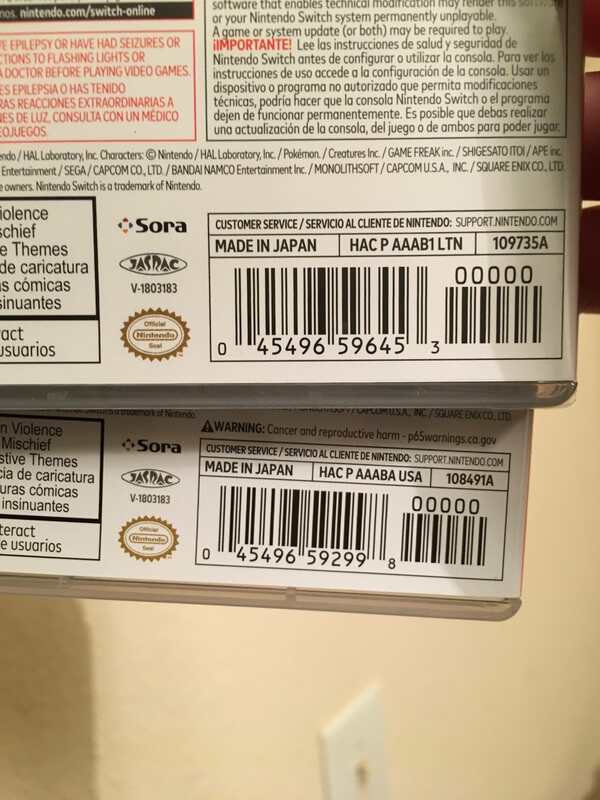 The cartridge itself also has a "USA" product code printed on it, even though the packaging is LatAm. So maybe there's no actual difference in the game itself. My Smash was USA version with no Piranha Plant DLC code. Seems like their stuff is all over the place. There is no code. You select the icon from the Switch menu and redeem the coins to your MyNintendo account. Once its registered, it's done. Interestingly, we were able to register that LatAm copy on a US Switch + US account and get the coins for it. Still waiting on the code e-mail though. EDIT: I've still got a sealed EUR copy of Let's Go Eevee from these guys that I'd rather pass along to someone here if they're interested in it than keep it for myself. I'm lame and OCD when it comes to my personal collection and would rather keep it all the same, even though I'm sure this version plays fine. I’m confused, where is this exactly? I don’t see it. On the Switch menu, go over the Smash Bros icon, and press Options (the '+' button). Go to the My Nintendo Rewards program. How long does it take to get the email with the download code? I did this last night and I still haven’t received it. Took me 2 days. Some people report a longer wait. Should be good to go, right? PM me your price, I’ll consider it. Update on warranty information for this: I've had the left joy-con desyncing issue with my unit (indicating these are old stock) and I called Nintendo for a warranty repair on the joy-con. I gave them my serial number and they confirmed I have the full one year warranty on the Switch with free repair in the US, even though it's a Latin American unit. My daughter's cheapo Switch arrived five minutes ago. Thank you, DailySteals. From 'quake area to big OH. Is there a way to tell when the console was manufactured? Tried to find one earlier and didn’t see anything. My tracking information finally updated this morning after a weeks of nothing. Switch came in this afternoon. Will definitely be keeping an eye on this for future deals. Actually mine says HAC S KAAAA USZ. I know USZ indicates the region. Does that mean it is in fact a US model? Nice, just got the code. Thanks! My 2nd Switch I ordered through this finally arrived. Ordered both the same day, but got 'em a week and a half apart. The 2nd Switch had one heck of an adventure across the US. Anyway glad it finally came, my brother will be getting a pretty nice gift for Christmas now. What nvidia exploit? I was reading that the older joy-con have a defect that cause them to intermittently lose signal or something and Nintendo fixes it for free. I haven’t called them yet but it’s definitely been happening all day today.